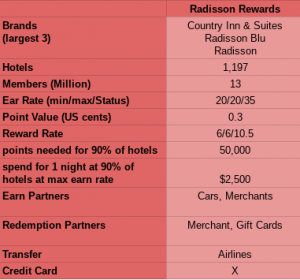 Radisson Rewards is the loyalty program of Radisson Hotel Group (RHG) and the successor of Club Carlson! Club Carlson went from much praised program to mostly ignored after a number of sharp devaluations. With new owners and a new name, RHG is re-launching the rewards program. Find out what it offers now and who it might be interesting for! Who are they? Radisson Hotel Group is a small chain with around 1,200 hotels around the world. In the US, you will mostly find midscale Radisson and Country Inn & Suites hotels in second- and third-tier cities, suburban areas or around airports. RHG has very little coverage of the top business and tourist travel destinations, like New York, San Francisco, Orlando or Los Angeles. In Europe, you’ll find mostly upscale Radisson Blu hotels, with great coverage of Northern, Central and Eastern Europe, often providing the only or best hotel chain choice! The map below shows that drastic split. You can find more details in the Radisson Hotel Group – Facts & Figures to see, if RHG covers the places you have to travel for business or want to travel for leisure. Why should I care? If you travel a lot to Europe, you will frequently find Radisson Blu as the only or best located upscale chain – with no Marriott or Hilton anywhere in sight, making RHG a good choice for frequent travelers to the continent. 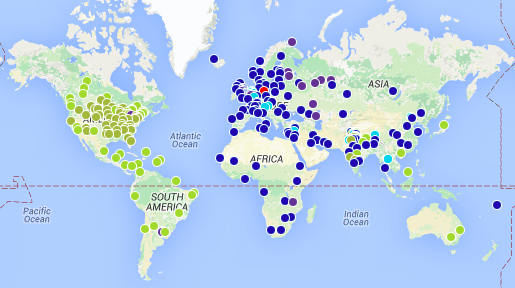 While Accor has many more hotels, the vast majority are budget ibis hotels or midscale properties. Radisson Rewards does have its fans – with 13 million members it has roughly half of Accor’s LeClub members despite Accor being 4 times the size of RHG! Earning Points: Club Carlson members earn 20 points per US Dollar spent at their properties, including room rates, meals and other incidentals. Even at a point value of only 0.3 cents/point, that’s an award rate of 6% and pretty generous! 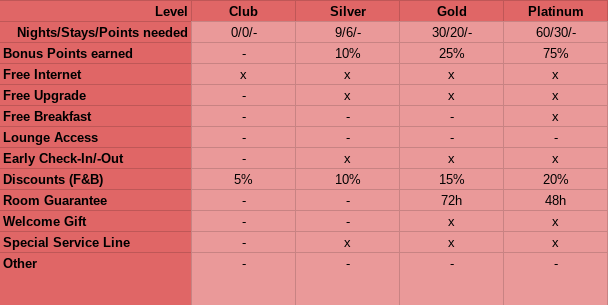 Elite members earn 23 (Silver), 27 (Gold) or 35 points (Platinum). You can also earn points through car rentals or a few merchants, but there is no shopping portal or airline partnership. The Radisson Rewards Premier Visa Card offers 10 points per USD spent at Radisson Hotels or 5 points anywhere else. Similar to other reward programs, there are few hotels in the lowest category (9,000 points/night), most of them in Russia or India. You need to redeem 15,000 points/night to get access to at least 10% of the hotels. 50,000 points will get you access to more than 90% of the hotels, with the most desirable properties costing 70,000 points/night. But at a point value of 0.3ct/pt, your maximum rate of 70,000 points equates to $210, making it a good back-up plan for expensive destinations, putting a cap on your hotel expenses! Radisson Rewards also allows you to redeem for Premium Rooms, for example a Business Clas room at a Radisson Blu hotel, at a 50% higher rate, with redemptions from 13,500 – 105,000 points! Radisson Rewrads offers a Points & Cash option, allowing you to use as little as 5,000 points per night plus cash payment, making it easier to redeem your points, if you don’t earn a lot of them. You can also redeem your points with a long list of partners, including transfer to 20 airline partners (at a rate of 10 points per mile), for gift cards (best case of 6.6 points per US$) or prepaid Visa cards (at 6.7 points per US$). Like with most rewards programs, those options are pretty bad value and I advise against using them. Club Carlson points expire after 24 months without activity, so you want to make sure to credit some activity to your account during any two-year period. You can qualify with either stays or nights and the entry level Silver only requires 9 nights and Gold a much steeper 30 nights. Neither level will get you much in terms of benefits. Radisson Rewards devalued the upgrade benefit – it now only includes an upgrade to a “preferred” room for Silver and Gold members, ie a higher floor (aka “fake” upgrades). Only Platinum members have a shot at room category upgrades, including suites, but they are not guaranteed here either. Platinum members do get free breakfast! You can still receive Gold Status by signing up for the Radisson Rewards Card, but it’s less attractive given the limited benefits! Bottomline: Radisson Rewards offers access to a limited number of hotels, with most upscale properties in Europe. The program offers generous earn rates and reasonable redemption rates, but few perks and little to attract customers of the much larger programs, like Marriott, Hilton or IHG. The re-launch of Radisson Rewards has so far only brought cosmetic changes, but little to bring customers back. It works best, if you stay for business at mid-scale hotels in the US and want to redeem for upscale hotels in Europe or if you travel a lot to Northern and Eastern Europe. Most other travelers are better of sticking with the larger programs and booking their occasional Radisson stay through Online Travel Agents and their more generous rewards programs!